The installation of a solar photovoltaic power plant on your property will reduce CO2 emissions while locally producing low-carbon electricity. A true steering tool for CSR policies, solar photovoltaic energy offers you the possibility to show your environmental engagement and to act for a greener plant. By becoming a cornerstone in a global movement, bringing many together around a visible project, it allows you to create a real dynamic in favor of the energy transition. Opt for solar energy and boost your CSR! Make your parking areas productive! To promote local investment, we offer the associates of your business or group the opportunity to participate in these projects in a win-win process. The gathering of funds from individual investors – organized through dedicated AMF accredited platforms – allows for individuals to participate in a solar project with a contribution within their means. The process is then similar to any other type of financial placement; the invested sums are repaid each year with an attractive interest rate. Adaptable, they can be tailored to the needs and desires of everyone, and present many benefits in terms of local, social, and environmental integration. Modernize the group’s real estate. Optimize the occupation of surfaces, the costs, and the productivity of real estate activity at the heart of the La Poste Group. Develop the La Poste Group’s real estate. It acts both as a real estate agent and as a service provider for the property holdings of 13,000 buildings and 7.6 million m². 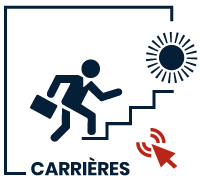 The company implements the La Poste group’s real estate policy and has developed an ambitious responsible development policy. To put this ambition into action, the Poste Immo signed a joint-venture with Urbasolar and Omnes Capital for the development and financing of photovoltaic projects throughout its real estate holdings. This process meant that the installation of photovoltaic power plants could be maximized under the technical, operational, and economic constraints. The conclusion of the partnership was accompanied by the creation of a holding company held by Urbasolar and Poste Immo Energies Renouvelables, which manages all the photovoltaic installations jointly. Today, 52 solar plants have been installed on different sites, mail platforms, sorting centers, and more representing more than 100,000 m² of equipped roofs. To optimize resources, the hospital made the decision to invest in renewable energy and thus participate in the energy transition without engaging investments. 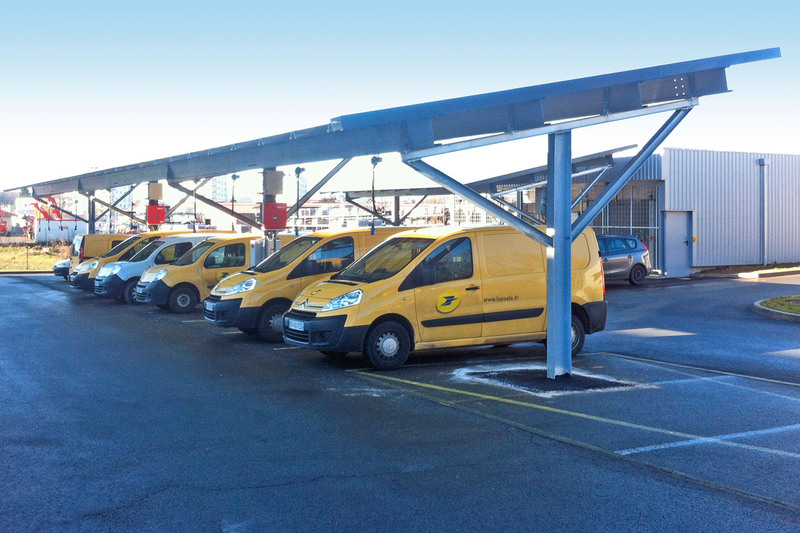 Urbasolar was the one to invest, design, install, and operate the 17,000 m2 of photovoltaic parking canopies with a capacity of 2.3 MWp. 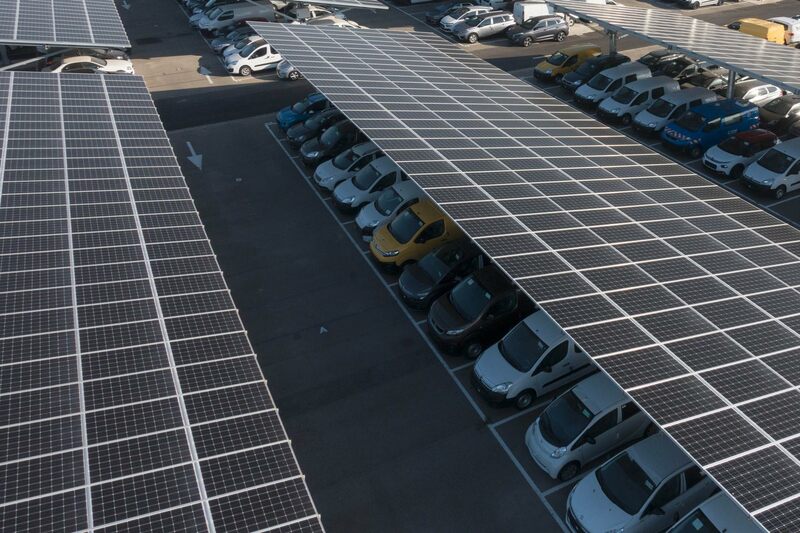 “We consulted with several companies specialized in photovoltaic energy to truly understand the economic models, with the goal of integrating into the university hospital establishment the installation of parking canopies. This operation allowed us to redesign the organization of the parking area in terms of quality, to create additional spaces, to develop alternatives to cars, and to increase carpooling, with the goal of reducing the amount of vehicles circulating at the hospital. A call for offers was launched at the beginning of 2017 and Urbasolar was selected for the pertinence and professionalism of their proposal, as well as it offering a more esthetically pleasing metal and wood solution.” With this project, the Nîmes Hospital is rethinking travel by reserving parking spaces for carpools, installing electric recharging stations, and is preparing to install electric bicycles for its employees.